The U.S. government on Thursday indicted two fugitives for alleged links to al Qaeda and roles in the deadly October 2000 attack on the destroyer USS Cole. Seventeen sailors died on October 12, 2000, when terrorists piloting a small boat drew up alongside the Cole off Aden, Yemen and detonated a massive bomb. The blast tore a gaping hole in the vessel. "Today marks another step in our nation's ongoing war against terror," said Attorney General John Ashcroft. "Almost three years have passed but our nation has not forgotten the tragic image for circumstances." The 50-count indictments charge Fahd Mohammed Ahmed Al-Quso and Jamal al-Badawi not only with a hand in the attack on the Cole, but also with an aborted attempt to bomb another American vessel, the USS The Sullivans, ten months earlier. Ashcroft described al-Badawi, a Yemeni, as a "key operative" in Aden who was enlisted by close aides to Osama bin Laden to take part in the Cole operations. He allegedly set up safe houses for those participating in the attack and obtained the boat used in the strike, as well as a truck and trailer used to move the boat around. Al-Quso was charged with facilitating the plot to ambush the Cole. Ashcroft said al-Quso prepared to film the attack from apartment on hill overlooking the harbor. Ashcroft said both men "are alleged to be longtime al Qaeda terrorist associates who were tainted in the al Qaeda caps in Afghanistan in the 1990s. They were schooled in Osama bin Laden's hate and vowed to attack Americans wherever and whenever they could." Both men were among 10 suspects who escaped last month from a jail in Yemen. They remain at large. FBI director Robert Mueller said he was "distressed by the escape." "With today's indictments they are now international fugitives," the FBI head said. "We will do what is necessary to locate them." Conspiracy to use, use and attempted use of weapons of mass destruction, namely a "large, high-explosive bomb"
Material support to al Qaeda. Ashcroft said the charges carry the death penalty. Asked why these defendants were charged as criminals rather than dubbed enemy combatants like some of the captured fighters from Afghanistan, the attorney general said that a criminal indictment "doesn't necessarily foreclose other options." Besides al-Badawi and al-Quso, the indictment lists a number of un-indicted co-conspirators. Among them is bin Laden, whom the indictment says planned the attacks. Other al Qaeda figures were named as having trained al-Badawi and al-Quso, enlisted them or used them for transporting al Qaeda money. According to the attorney general, the attempt on USS The Sullivans took place on Jan. 3, 2000, and was aborted when the boat sank under the weight of the explosives. Ashcroft said the plotters salvaged the explosives and strengthened the boat. 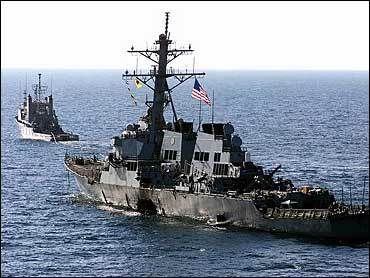 "Their work was complete by the time the USS Cole came to port," he said. In the attack, the bombers allegedly deployed their boat and approached the destroyer "offering friendly gestures until they were close enough to ignite the deadly blast," Ashcroft said. Before announcing the indictments, the attorney general met with friends and family members of the Cole victims, for whom he said the attack of nearly three years ago is still a "fresh wound on their hearts." Al-Quso and al-Badawi escaped April 11 from a Yemeni jail through a hole in a bathroom wall in their detention cell. Authorities in Yemen believe the men traveled either to al Qaeda strongholds in the country's northern provinces or to the Red Sea port of Al-Hudaydah, where some were from. Yemen has offered a reward of $8,300, a sizable sum in that country, for information leading to the arrest of the 10 escaped suspects.